Researchers have uncovered a species of plant-eating dinosaur in Alaska. For at least 25 years, the fossils were lumped in with another hadrosaur, Edmontosaurus, a species well known in Canada and the U.S., including Montana and South Dakota. The formal study of the Alaska dinosaur revealed differences in skull and mouth features that made it a different species, Druckenmiller said. The differences were not immediately apparent because the Alaska dinosaurs were juveniles. 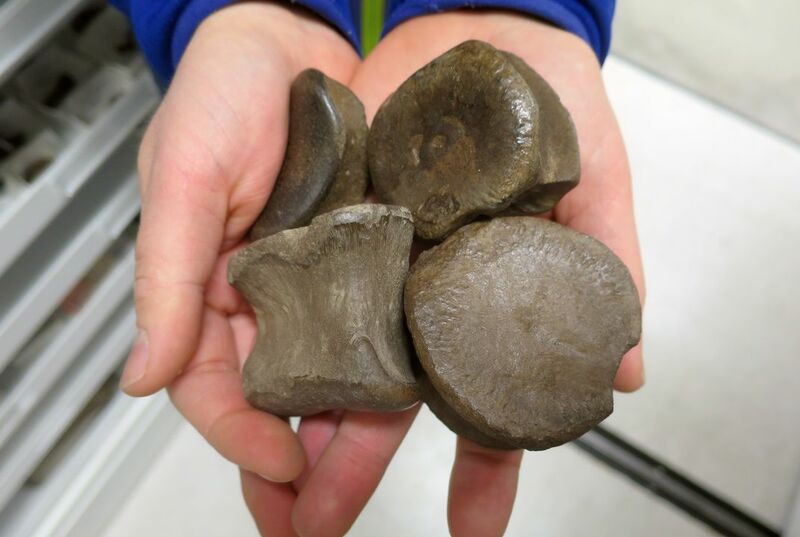 Researchers teased out differences in the Alaska fossils, Druckenmiller said, by plotting growth trajectories and by comparing them with juvenile Edmontosaurus bones. Researchers have dubbed the creature Ugrunaaluk kuukpikensis (oo-GROO-nah-luk KOOK-pik-en-sis). The name means "ancient grazer" and was chosen by scientists with assistance from speakers of Inupiaq, the language of Alaska Inupiat Eskimos. The dinosaurs grew up to 30 feet long. Hundreds of teeth helped them chew coarse vegetation, researchers said. They probably walked primarily on their hind legs but could walk on four legs, Druckenmiller said. Museum scientists have excavated and catalogued more than 6,000 bones from the species, more than any other Alaska dinosaur. Most were small juveniles estimated to have been about 9 feet long and 3 feet tall at the hips. "It appears that a herd of young animals was killed suddenly, wiping out mostly one similar-aged population to create this deposit," Druckenmiller said. UA Fairbanks graduate student Hirotsugu Mori completed his doctoral work on the species. 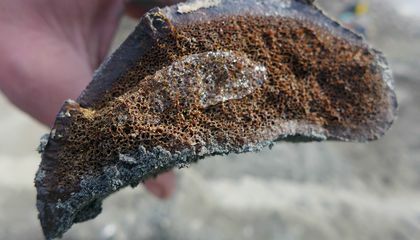 Florida State University researcher Gregory Erickson, who specializes in using bone and tooth histology to interpret the paleobiology of dinosaurs, also was part of the study. They published their findings in the "Acta Palaeontologica Polonica," an international paleontology quarterly journal. Researchers are working to name other Alaska dinosaurs. The researchers said that at least 12 to 13 distinct species of dinosaurs lived on the North Slope in northern Alaska but they have not been able to retrieve enough material to name another species. The new species of dinosaur was named ¨Ugrunaaluk kuukpikensis¨ because it means ¨ancient grazer.¨ The name was chosen with the help of speakers of Inupiaq, the native language of Alaska. The name ancient grazer was chosen because it was similar to, but not as evolved as certain other species of dinosaur and was an herbivore. I was interested in this article because I have always taken interest in dinosaurs and the discovery of a new species is even more fascinating. I was surprised that the dinosaurs that lived in Alaska were not as evolved as those that lived in other places. The reason the Dinosaur's named "Urgrunaaluk Kuukpikensis" was because they were "ancient grazers" That meaning, I believe that they were herbivore at least that is what is explained in the article. People finding new dinosaur species is really awesome. Its been millions of years and still were finding new things out about our earth and the life on it. Researchers find new animals all the time. Even if dinosaurs are extinct, there are more of new animal remains being found all the time. Human technology can only go so far to find new species. The ocean has a depth that would crush a human and/or drone, which leaves us to wonder what is down there? Like the others have said, the dinosaur was called that because it grazed grass. The article also talks about how Alaska may have been a warmer climate many years ago. I wonder how warm it actually got. The cold is really the only thing keeping me from moving out there and living on my own. It's interesting that archeologists are finding new (old, technically) dinosaurs. It's not that different from the Edmontosaurus, but still different. The new dinosaur was named Ugrunaaluk kuukpikensis because it means ancient grazer. The dino was found in 69 million year old rock and it is plant-eating. So the name explains it all. The Alaska dinosaur was named Ugrunaaluk Kuukpikensis,translating to ancient grazer, because it would graze upon the coarse vegetation in the old Alaska territory. The dinosaur was given this name because it means ancient grazer and this dinosaur was one of the first dinosaurs ever to exist. The dinosaur was named "Ugrunaaluk Kuukpikensis" because the term means ancient grazer, and it was originally chosen buy the Alaskan Scientists who speak the language of Inupiaq. The dinosaur's name meant ancient grazer because they were ancient, and they were herbivores hence grazer.